When tackling complex issues, it’s essential to bring diverse perspectives and skillsets to the table. Image composite: Micke Tong. The architecture, engineering, and construction (AEC) industry is the perfect embodiment of what it means to be big: towering skyscrapers, massive bridges, expansive tunnels, and innovative and inventive designs. Yet small can also be powerful, especially when it’s rooted in passion and purpose. These are the foundations on which Axoscape was built. Based in Houston, Texas, Axoscape helps architects, contractors, and subcontractors understand BIM (Building Information Modeling) technology to stay relevant in the industry. Despite having only a nine-person team, the expert BIM-services firm is making a significant impact by taking on projects with a purpose, whether it’s laser-scan-like photogrammetry of damage from Hurricane Harvey or partnering with Habitat for Humanity, Houston Food Bank, and other organizations supporting their communities. 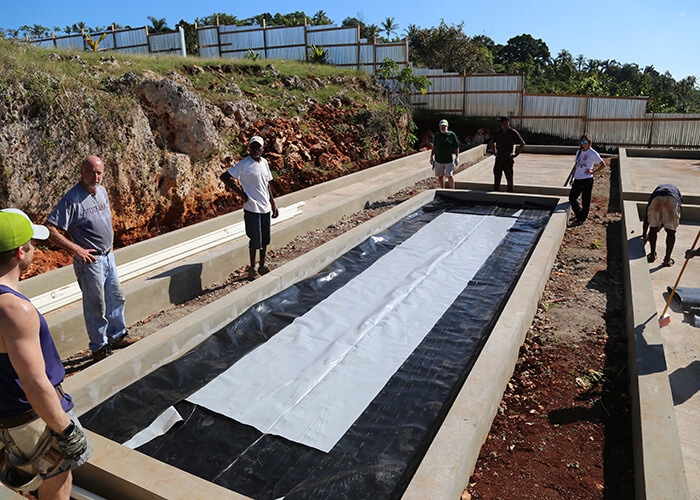 Installing the lining for an aquaponics farm at A Child’s Hope, a home for lost and abandoned children, near Jacmel, Haiti. Courtesy Dat Lien. Putting theory into practice, one of Axoscape’s first challenges was assisting with rebuilding efforts after Hurricane Harvey struck Texas in August 2017. The storm’s staggering 27 trillion gallons of rain caused flooding across the state and an estimated $75 billion in losses, and displaced thousands of people from their homes. The project started when a friend and colleague asked Lien to scan what was left of his house, post-hurricane. Using photogrammetry and laser scanning, Lien and his team created a 3D model of the house. “We were able to give him a starting point, a footprint of what his house would look like,” Lien says. Lien is currently exploring crowdsourced mapping, in which communities would perform the reality capture themselves. They would take 360-degree photos of their homes’ interiors, use drone footage for the exteriors, then all these images could be stitched together using photogrammetry to create highly detailed 3D models. This process could help people better prepare for the future, as the scans can be used for rebuilding or assessing future damages. 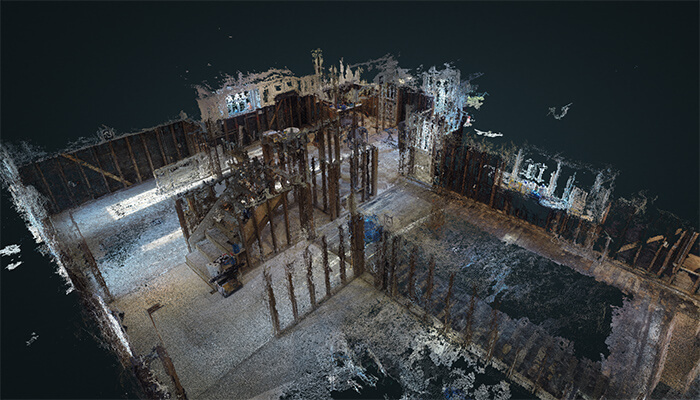 A point cloud of a scan of a home devastated by Hurricane Harvey. Axoscape is exploring crowdsourced mapping in which communities perform reality capture. Courtesy Axoscape. Here, Lien offers some advice for AEC companies who want to keep their numbers small but make a big impact in the industry—and the world at large. Lien found that to support innovation, he needs two types of people: those who consistently come in early and get things done, and those who stay late to research and experiment. “I feel like you need a combination of both because if everyone was the same and did the same thing, we wouldn’t be able to innovate the way we do,” he says. Business owners: Learn how BIM impacts your bottom line. While Lien hires diverse personalities, they’re united through company culture. For example, Axoscape holds lunch-and-learn Fridays to keep things interesting and develop team skills. Lien and his team also enjoy gaming, so when he’s hiring, he looks for other people who will fit the culture and add to the positive energy. “There’s a lot of energy around having fun at work,” he says. “We have this media room where we get together every Friday and play Rocket League. 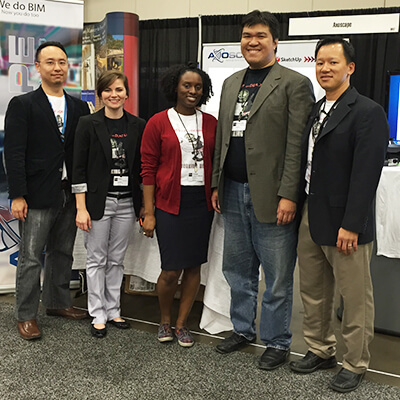 A few members of the Axoscape BIM team, left to right: Tony Trinh, Katie Watton, Crystal Miranda, Ryan Nguyen, and Dat Lien. Courtesy Axoscape. Lien chooses work that is ultimately fulfilling and purposeful, from bringing subcontractors up to technological speed to helping companies such as Hudson Building Systems become more nimble and efficient through BIM and lean construction. He helped Hudson Building Systems plan further ahead to reduce rework, as well as obtain more accurate data and minimize construction risks. When deciding which projects to take on, Lien says that it comes down to providing value. There’s a growing skills gap in the AEC industry, particularly in construction, which is suffering a skilled-labor and engineering shortage. 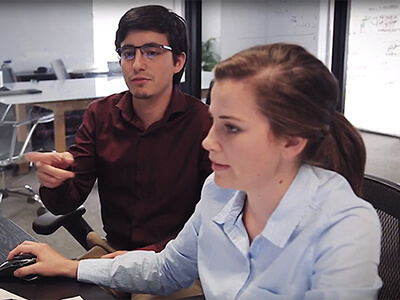 Axoscape’s Xavier Loayza and Katie Watton collaborate on a project. Courtesy Dat Lien. 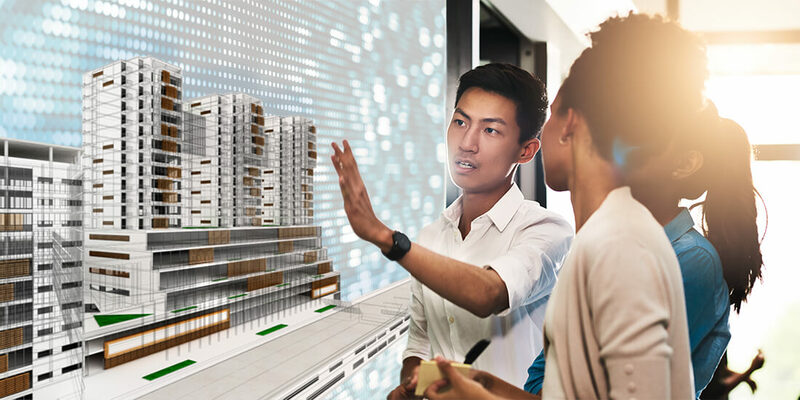 And, by training and reskilling people, as well as teaching them tools such as Autodesk BIM 360 and Revit, Axoscape helps fill the roles needed to meet the demands of the building industry, as well as ensuring people aren’t left behind as technology accelerates. For instance, the firm hired a Forever 21 employee who had left the retail industry and learned a new trade through Axoscape. “He wanted to do something more with his life, so we’re giving that opportunity,” Lien says. By combining this expertise with technology, passion, and purpose, Axoscape demonstrates that small can indeed be powerful.